Michael Chang has created a layered installation on the Real Wall exploring identity, gender, and materiality. Utilizing clothing, a material he often uses to reflect on identity construction and personal memories, Chang has created a large-scale sculptural tapestry that is a record of his fluctuating emotional and mental state during his time so far in New Haven, Connecticut. The clothes are sourced from multiple trips to Saver’s 50% off sales, at which he would hoard menswear. In addition to the fabric piece, framed photographs and prints hide behind the surface of the quilt curtain. 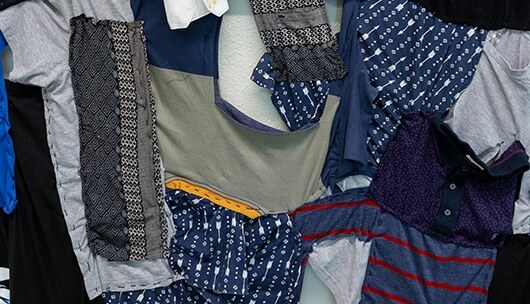 Viewers can peek in between the holes and gaps in the clothing to discover what’s behind the smiles. “I’m a Taiwanese American conceptual artist who reflects and articulates my experiences. I form the conceptual foundations of my practice in a localized way, considering anecdotes, memories, and objects from my life. I conflate these personal details and moments with broader systems that affect and interest me: cultural heritage; aspirational movement; urbanism; historical revisionism; racism; intergenerational trauma and identity politics. Michael Chang is a Taiwanese American conceptual artist. He was born in 1995 and raised in Irvine, California. He received his BFA from the University of Southern California in 2016. Recently solo exhibitions include a site specific solo exhibition in his childhood home titled Suburban Dreaming in the summer of 2018, which was followed up by a sequel exhibition at LA Artcore Brewery Annex titled Space-time Displacement. Both exhibitions dealt with his memories, identity politics, and the psychological conditioning of growing up in the suburbs. Notable group shows include FRESH 2019 at SoLA in Los Angeles, Home at Collarworks in Troy, New York, and No Longer Negotiable at Nous Tous Gallery in Los Angeles. In conjunction with the work shown in No Longer Negotiable, Chang and a group of collaborators put together a fashion show as a public program for the exhibition. Chang’s work has also been published in an independent anthology of Asian American artists called Bow, featuring writers, poets, musicians, and visual artists. He currently lives and works in New Haven, Connecticut.